One Maltese of note, Issa, was owned by Publius, the Roman governor of Malta in the 1st century. Issa was described in a celebrated epigram as “frolicsome … purer than a dove’s kiss, gentler than a maiden … more precious than Indian gems.” Many famous authors and scholars, including Pliny the Elder and Strabo, wrote of the beauty, finesse and irresistible charm of the tiny Maltese dog. The Greeks erected tombs to their Maltese and, from the 5th century on, these ornate dogs are represented in Greek ceramic art. Archaeological evidence exists to show that Maltese dogs were owned by the Egyptians who may have worshiped them. The Maltese has been highly valued in society throughout time. In fact, one account is of a Maltese being sold in the 1500s for the equivalent of $2,000. 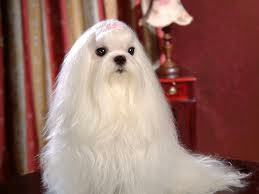 It is said that Maltese dogs were particularly popular with women who carried them in their bosoms or their sleeves. Invariably, scholars of yore drew attention to the breed’s diminutive size. In 1792, the botanist Linnaeus referred to Maltese as being “about the size of squirrels.” The first Maltese exhibited in the United States was white and listed as a “Maltese lion dog” at Westminster’s first dog show in 1877. The American Kennel Club registered the Maltese in 1888.